Morzine is well-known as the central access point for the vast Portes du Soleil ski area, but outside of the ski season the town regains its summer charm, tourist numbers decrease and the surrounding countryside opens up as a massive alpine adventure playground. The slopes become green pastures where cows, sheep and goats graze, bright flowers hang from balconies, restaurant terraces spill onto the pavement and a laid back vibe takes over the town. It’s eerily quiet in the daytime when visitors escape to the lakes, trails and rivers, until mid-afternoon when sun-tanned walkers, bikers and rafters filter in for nutrition and a well-earned kip. Apart from the odd whiff of a BBQ the air is fresh and the sky dotted with clusters of colourful parachutes from paragliders enjoying their own slice of this natural paradise. If you say you want to swim, the tourist office is likely to send you to the town’s Olympic-sized swimming pool, but for a more natural experience follow the locals for a refreshing dip in the region’s crystal clear waters. 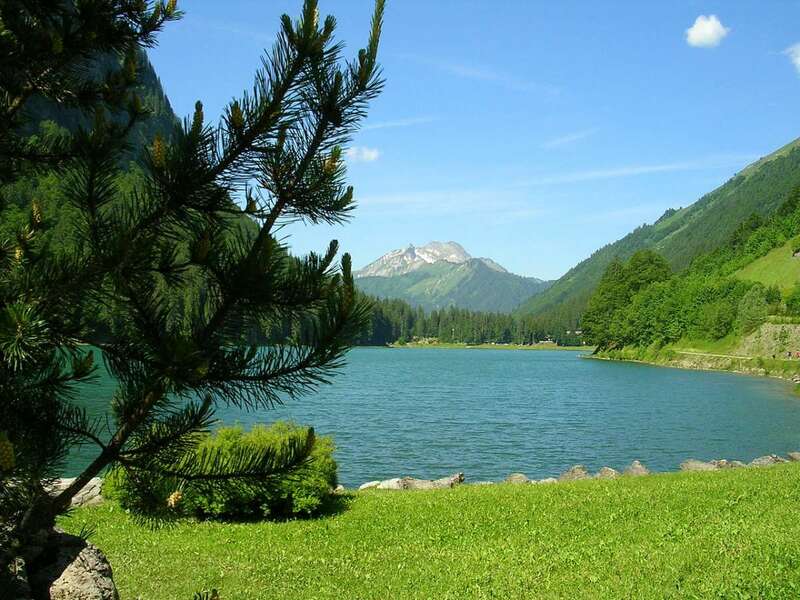 Just a five minute drive or twenty minute cycle outside of Morzine is Lac Montriond. In a setting surrounded by mountain cliffs and waterfalls, if the chilly water doesn’t take your breath away, the scenery certainly will. There’s a walking path around the lake, bathing areas at each end and facilities for canoeing, kayaking and stand-up paddle boarding. For a more Mediterranean feel head to Excenevex on Lake Geneva (or Lac Léman as referred to by the French). Pine trees boarder the four hectares of natural beach which plunges gently into the lake. If it wasn’t for the mountains in the distance (and the swans on the lake) it would be easy to imagine you are on the French Riviera. There’s still some dispute over where the sport of paragliding was first invented, for a long time it was considered to be Mieussy, a small town just 23km from Morzine. Whether or not it is the founding spot, it is certainly where the concept flourished from the passion of several of the great grandfathers of the sport. Due to the pronounced thermals and remarkable scenery, the region continues to remain on every paragliders hit list, and even for the untrained an opportunity to take to the skies is not too be missed. For around 75€ you can experience the thrill of freefall on a tandem flight with an instructor such as Aero Bi and see views of Mont Blanc and Lake Geneva. Paragliding flights start from 75 euros. 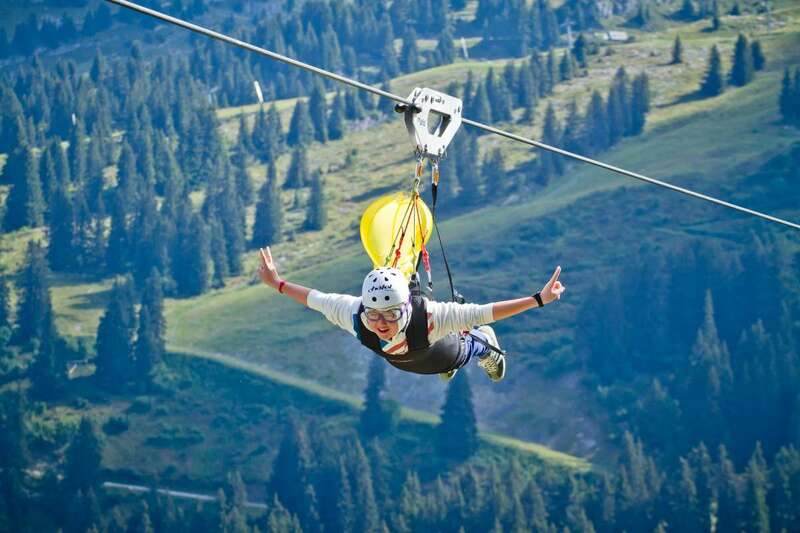 Another adrenaline inducing way to see the mountain landscape by air is on a 1325m long zip wire at Fantasticable in nearby Châtel. Strap in and hold tight as you fly along at speeds of 100kmph. You might not have much time to admire the view, but it is sure to be one of the most fun and memorable experiences of your trip. You can buy a ticket for 36 Euros from Ski Pass Chatel. You access Fantasticable via the Pré-la-Joux chairlift. Inspired by television footage of the Tour de France, every year thousands of road cyclists flock to the French Alps to test their stamina on the great hill climbs of the competition. One of the most iconic climbs, the Col de Joux Plane, stretches from Morzine to the beautiful historic village of Samoëns and is renowned for putting Lance Armstrong in trouble during the 2000 Tour. You need to be fit to tackle this climb, but many tourists do and the stunning views of Mont Blanc from the top make it worth the effort. If coming down is more your thing, the extensive summer lift system will give you access to downhill and cross-country trails whatever your level. Morzine is in the most central position of the Portes du Soleil, meaning once off the trail you can freewheel down to the town from most of the lifts. 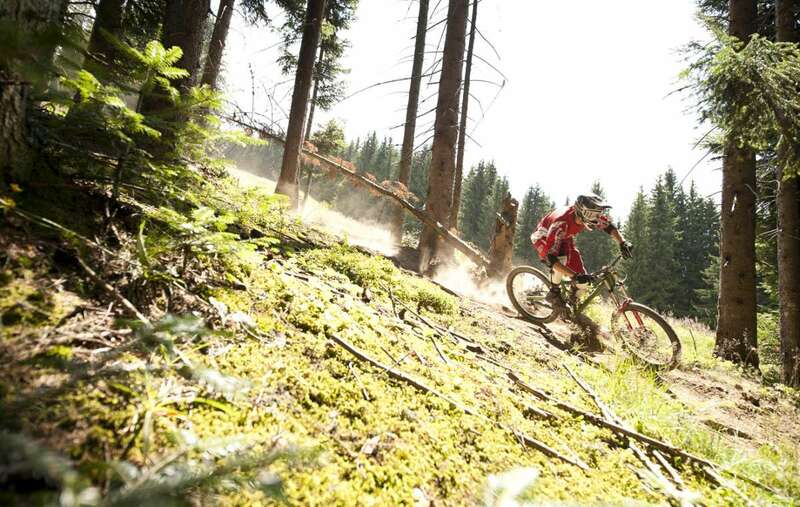 Unless you have a friend who can show you the ropes, if you’ve never tried downhill mountain biking before it’s best to seek out a guide. You’ll find it easy to get kitted out with all the equipment you need, pick up maps and a guide from the many sports shops and services in town. There are several shops where you can hire downhill and road bikes – try Torico on the main street in Morzine. First-timers should consider having a guide and you can find one at Ride Ability who will take you on trails suited to your ability either in groups or privately. Whilst the town has a decent selection of eateries serving up typical Savoyard dishes and fast food, it’s worth doing your research and going the extra mile or two for something special. 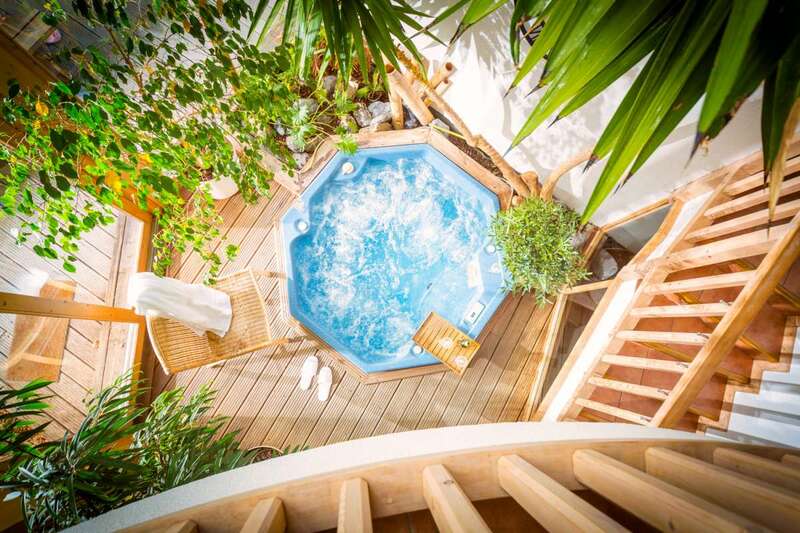 Situated at the top of the Col D’Encrenaz at 1490m, Exclusif has that ‘best kept secret’ feel about it. Great for lunch, here you can sip delicious wine from a skilfully chosen selection and enjoy Savoyard specialities, fish and steaks accompanied by an incredible view. Les Mines d’Or is another lunch spot with a view. A more traditional option, from the outside the building looks like an oversized mountain hut and it does in fact double as a refuge for hikers. You can fill your boots with the daily three-course menu for under €23. Sitting in a mountain wet-lands area with a lake next door, fresh water fish feature heavily on the menu, as does ‘Grandma’s favourite rabbit dish ‘lapin à la crème’. For a more central option, L’Atelier stretches Savoyard cuisine beyond its geographical limits. The talented young chef Alexandre Baud-Pachon serves a speciality of lobster ravioli with creamy shellfish coulis and ginger emulsion. It’s one of Morzine’s pricier options but is worth splashing out on if you’re searching for a more sophisticated French dining experience that excludes cheese, ham and potatoes. 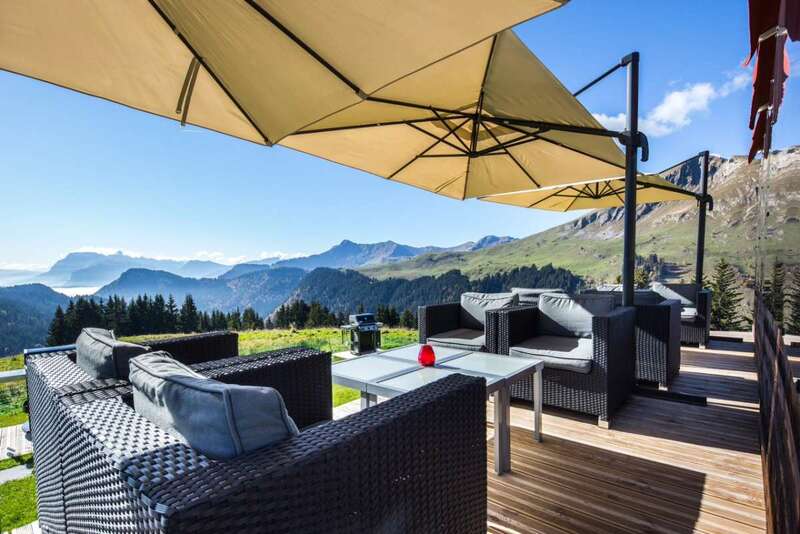 Equipped with gigantic windows, balconies on every side of the property and a mountain-facing indoor hot tub, Chalet de L’Ange in Morzine has been designed to showcase the alpine environment from the comforts of a luxury chalet. The chalet is on many of the bike routes and is just five minutes from central Morzine.